I've previously tested a smaller New Bright RC Touch car, but a reader tipped me off to this 1/12th scale version and the fact that it may be a much better performer. This 1/12th scale RC Touch street car features a very thin, removable plastic body that bends slightly to easily handle impacts, while the very small amount of material used to make it allows the whole car to be very light in weight. Included in the package is a big 9.6V battery & charger like I'm used to seeing used on significantly larger vehicles. This by itself hinted that I'd be in store for a fast drive. Of course the key unique feature of the RC Touch cars is their controller, which at first glance looks a lot like a touchscreen phone or music player. It actually has four fairly traditional buttons in it, but those buttons are recessed neatly behind a glossy, flat screen with direction arrows that light up. Check out the video for a closer at the features of the car and to see it drive. 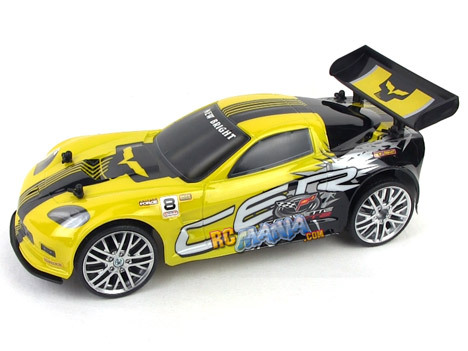 The performance of this 1/12th scale New Bright RC Touch car is really good, as it accelerates quickly to a very respectable top speed, and it turns quickly, too. As shown in the video, though, it's unnecessarily difficult to control at speed. A more conventional controller could actually have made this one of New Bright's best products in a long time. In spite of the "8+ years" recommendation, I actually think the RC Touch cars are best for younger kids who will get a real kick out of having a touch screen styled controller with lights, and who will be more patient with moving a little at a time instead of racing around in a more continuous fashion. This isn't a particularly bad car, but it could & should have been a lot better.